About fifty sinhalese journalists and three Buddhist monks from Hambantota, Galle and Matara from south of Sri Lanka arrived in Trincomalee Saturday evening on a four-day good-will mission to obtain first hand information about problems faced mainly by Tamil people and others in the Trincomalee district and in areas held by the Liberation Tigers of Tamil Eelam (LTTE). The National Peace Council (NPC) of Sri Lanka organized this visit, sources said. The members of the team first met with the representatives of non-governmental organizations in the district at Trincomalee Shanmuga Boys Home located in front of the Trincomalee harbour along Inner Harbour Road. The Trincomalee District Gandhi Sevai Association (TDGSA) arranged the discussion, sources said. 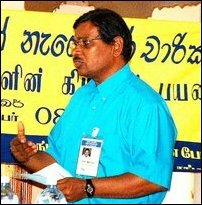 Dr. K.Jeyakantharajah, President of the TDGSA in his opening address brought to the notice of southern journalists that Tamil people in Trincomalee are living in constant fear due to the deployment of government troops in large numbers. Troops are seen in the east port city everywhere causing hardships to the free movement of Tamil civilians, he said. He recalled the days of war when there were army checkpoints at selected strategic places. But now during the ceasefire period checkpoints are seen at every junction, in front of every school. Soldiers stop and order Tamil passengers to get down from buses and other vehicles for body checks. Tamil women especially girls feel deeply humiliated by the arbitrariness checks and indecent methods used by the soldiers, he said. He added Sinhalese in south of Sri Lanka should understand the feelings of Tamils in the northeast. Sinhalese journalists who are visiting should take this message to their people in the south, he added. Mr.S.P.Nathan, NPC national co-ordinator outlined the objective of the goodwill mission was to allow ordinary people of both communities should meet and exchange their views regarding their problems and needs. Hence the NPC has planned several discussions involving ordinary people from both communities. The goodwill mission by southern journalists to Trincomalee is a part of the project, Mr. Nathan said. 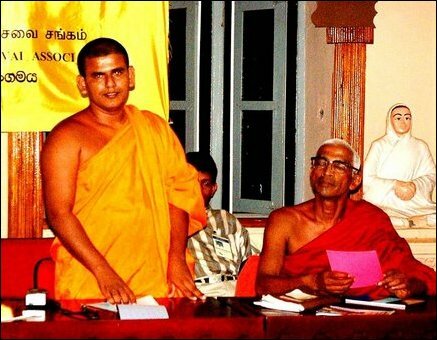 Venerable Morahela Sumanaransi Thera of Ambalangoda said all Buddhist priests in south of Sri Lanka are not members of Jathika Hela Urumaya (JHU), all monks' political party and all Sinhalese are not supporters of the Janatha Vimukthi Peramuna. The major political parties are not reflecting the views of all Sinhalese people in the south. "Seventy percent of people in the south are for peace and negotiated solution to the problems affecting Tamil people through peaceful means. They are against war," he added. Political parties are responsible for the current crisis in Sri Lanka. They divide the people on communal basis to capture power, he added. Venerable Mawadamila Shantha Thera said all communities should work for a united Sri Lanka sharing all resources equitably. Representatives of NGOs exchanged views regarding the role of journalists especially in the south in exposing the true plight of Tamil speaking people who are living in the northeast in refugee camps and welfare centres and their suffering due to war and tsunami without state assistance even after the ceasefire agreement.